The Town and country planning Act 1947 set the post war framework for new developments which required a planning permission. The system has essentially remained the same since the initial 1947 act, which repealed all previous legislation, including the first Housing and Town Planning Act 1909, followed by second in 1919, the Town Planning Act 1925, and Town and Country Planning Act 1932, 1943 and 1944. General Interim development orders were around at the time of the 1947 legislation, and Sandwell Swanwatch ordered a full planning history of the Trinity Street site, researching all the applications held on microfilm at Sandwell Council planning office since 1947 to the present day. This in itself raises some issues concerning transparency and, whereby those wanting to research such subjects not only have to find the time, but also have to pay for the privilege. Building regulations records regarding site investigations are also protected by copyright, meaning that key information cannot be taken outside of the Council house for professional or legal advice on contentious issues- or scrutiny of any improper conduct by officers who have approved regulations which may later prove to have been ill judged. This is clearly not in the interests of transparency or democracy. 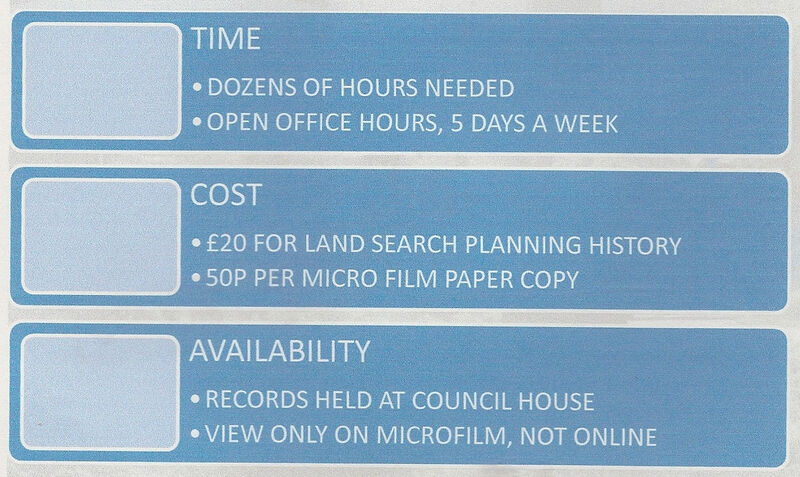 The majority of the planning records are held only on microfilm, and are not publicly available unless viewed at the Sandwell Council house. Only those applications after 2003 appear online on the Sandwell council planning website. The following barriers to obtaining this informed information is important to note. The regulatory authority controlling planning applications has altered over time, both at this site and at Rattlechain. Inevitably this historically allows some blame to be transferred to the previous authority when contentious, (or downright outrageous) decisions were made, even though in reality the same individuals still remained in the key positions of authority during transition phases. Oldbury became an Urban District in the 1890’s with three main townships, Oldbury itself, Langley and Warley. It received its charter in 1935, as the ‘Municipal Borough of Oldbury’. With the creation of the Town and Country Planning Act of 1947, applications within the area were given an OB prefix. The Trinity Street site fell within this area. In 1974 the County Borough of Warley was combined with the County Borough of West Bromwich to form the new ‘Metropolitan Borough of Sandwell’. Applications were now given the DC prefix standing for Development Control. The Black Country Development Corporation, a regional development agency was established in May 1987 to develop certain areas of land in the Metropolitan Boroughs of Sandwell and Walsall. Its powers, defined by the 1980 Local Government, Planning and Land Act included Planning control – Assuming the development control function within its area although in practice the local authority of Sandwell continued to administer the system subject to consultation with the BCDC. It was dissolved in 1998. The planning application numbers during the ten year period were given the prefix BCS within the BCDC area. Both the Trinity Street site and also The Rattlechain lagoon area were within this corridor. On resumption of total planning control from 1998, Sandwell Council once again gave applications DC prefixes. On viewing every single micro film record held we believe that there are many disturbing leitmotivs running throughout the development process concerning applications decided at the Trinity Street site. These can be summarised as follows. The earlier files from the time of the 1940’s and even much later contain very basic information about proposed developments and the files themselves are extremely limited on detail or building control matters. Almost 100% of applications related to this site were approved, mostly without any independent scrutiny or concerns of local resident s recorded on file. There is virtually nothing about the concerns of local residents recorded- despite everyone in the local area being aware of Albright and Wilson’s activities- and their chemical fallout. Is it the case that these concerns were deliberately omitted from public record to protect this business employer?- we believe that this was the case. The lack of concern or apparent problems with existing operations on site are seen as an excuse for allowing more plant and more chemicals to be used on the site, as is the existing location of the site given that developments are within the existing site. There are alarming admissions of pollutants known to be being emitted from the factory- but no apparent health concerns at what these chemicals could cause, both to the workforce or nearby public. The Health and safety executive offer the most limited of comments along the lines of “we do not believe that the proposal would affect the existing major hazard installation.” In other words, because it is already there, a bit more won’t hurt. The decision making process of allowing more plant was influenced by seeking opinion from other local authorities where the manufacturers existing factories were based and from where processes were switched to Oldbury. This is not very reassuring when these plants themselves such as that at Kirkby later closed due to “catastrophic fires” and were also riddled with their own health and safety shambles of an operation. Regulators of the site appear to offer no concerns at the use of asbestos sheeting and other materials or how these materials would be disposed of during demolition works involving buildings containing such dangerous materials hazardous to human health. Decisions appear to be made from information offered by Albright and Wilson themselves- basically alchemists conning the planning officer laymen with their “safe science”, with no independent advice taken, except by those organisations which offer little or no technical advice either. We cite examples in relevant case studies to illustrate these concerns, also using information collected from Albright World and other sources which reported them at the time. Collectively the applications add up to a shocking allowance and clearance of toxic plant based upon the most limited of safeguards; unfortunately this is probably typical of the period following post war impetus for giving large businesses just what they wanted- particularly those which had been deemed to have helped the war effort.